India Post offers various small savings scheme for citizens. They offer low risk, fixed return products. Some of the popular small savings schemes are National Savings Certificate (NSC), Kishan Vikash Patra (KVP) etc. You can also invest in Public Provident Fund (PPF) and Sukanya Sammriddhi Yojana (SSY). 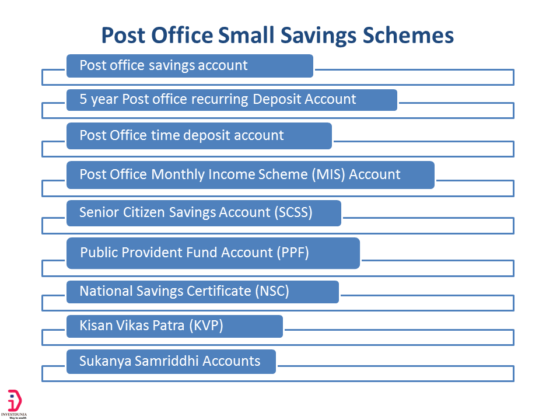 In this article we will discuss all post office savings schemes and its benefits. We will discuss the different schemes, its benefits, disadvantages, what will be applicable for you to invest and how you can invest in those schemes. There are total nine products listed under the post office saving schemes. This is a normal saving account like a saving bank account. You can deposit or withdraw money from the account as per your requirement. Post office savings account gives you 4% interest as most of the savings bank accounts. You don’t need to put much amount to open a savings bank account in post office like banks. A minimum of Rs 20 can be deposited while opening a bank account. This is surely a very positive point for the poor who does not have a bank account. The minimum balance is Rs 50 for a non-cheque account and Rs 500 for the account which has cheque book facility. You can transfer your existing account to the account with cheque facility. One account can be opened in one post office and you can transfer the account to another post office if you have been relocated. The account has nomination facility so that the deposited amount can be given to the nominee in case of your death. The account can be opened in the name of the minor and above 10 years age minor can operate the bank account by him or her. Like the bank accounts, a joint account in the name of two or three persons can also be opened. At least one transaction (Deposit or withdrawal) should be done once in a three financial year to keep the account active. Accumulated interest of up to Rs 10,000 is free from income tax. The deposit and withdrawal through electronic mode is available for post offices with CBS facilities. You can have internet banking facilities also. 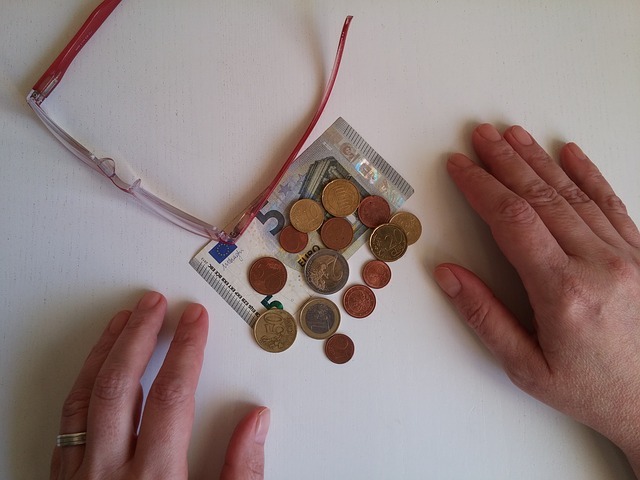 Opening a savings account in post offices is very simple. First, download the account opening form and take a print-out. Else you can collect from your nearest post office also. Fill up the form with some simple details such as the name of applicants, address, Date of birth, nomination details etc. Your account will be opened by post office officials and you can transact after that. You may want to know How to get the highest savings account interest. This recurring deposit account is one of the popular savings options under post office savings scheme. 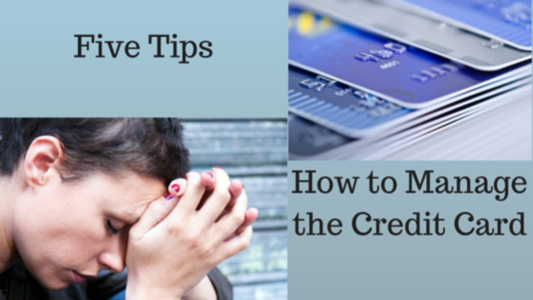 You can deposit the amount monthly to have a significant amount at the time of maturity. If you start early and know the importance of systematic investing without taking any risk, this can benefit you to a large extent. You can start a recurring deposit with as minimum as RS 10 per month. You can invest Rs 10 per month or any amount multiples of Rs 5 thereafter. There is no maximum limit of the investment. If your account is opened between 1st and 15th date of the month, you can deposit every month up to 15th You can deposit between 16th to last working day of the month if you have opened the account after 16th of a month. If you don’t pay the subsequent deposit, a default fee is to be levied. A default fee of 5 paise for every Rs 5 is applicable as default fee. The account will be reviewed within two months if you have not deposited for four months consecutively. After two months it will be discontinued and you will not be able to deposit the account. You can take the rebate in the case of payment of 6 installments in advance. The recurring deposit can be opened with joint holdings. It can be transferred to joint from single holding and vice-versa. One can withdraw a maximum of 50% of deposited amount after one year of opening the deposit. The withdrawn amount should be in multiple of Rs 5. The amount with interest should be repaid in a lump sum or EMI before maturity of the recurring deposit. Opening a recurring deposit in post offices is very simple and same as opening a savings account. The post office time deposit account is like fixed deposit of banks with different tenures. One can open a time deposit with as minimum as Rs 200. The interest is compounded quarterly and accumulated in the account annually. It has features similar to the savings account. Any Indian citizen can open a time deposit individually or jointly with others. There are 4 options to choose the tenure i.e. 1year, 2 years, 3 years, 5 years. You can transfer the account to other post offices. The account can be shifted to single mode or joint mode from another. There is no maximum limit for the investment. The cheque is also allowed provided the value date will be the cheque realization date. If you hold the time deposit in CBS post offices, the deposit will be automatically renewed for the same tenure as it was. The investment in 5-year time deposit is tax-free under section 80C of income tax act. How to open a time deposit account? Your account will be opened by post office officials and you will be given a deposit certificate. This scheme is very much popular with the senior citizens. Many of them have used this facility as an option of pension account. You invest a one-time lump sum into this product and get the monthly income from it. The minimum investment is RS 1500 and maximum investment is Rs 4,50,000 when held by single and Rs 9,00,000 when held in a joint account. It is considered that joint account holders have the same share of money deposited in the account. Nomination facility is available. The account can be opened in the name of the minor and can be shifted to his or her name after attaining the age of 10 years. Single holding account can be shifted to a joint account or vice versa. Interest can be withdrawn through auto credit into savings account standing at the same post office, through PDCs or ECS. In the case of MIS accounts of CBS Post offices, monthly interest can be credited to a savings account of any CBS Post offices. You can prematurely encash after one year but before 3 years at the 2% less rate of the deposit and after 3 years at the 1% less rate of the deposit. How to open the Post Office Monthly Income Scheme or MIS? The senior citizen savings scheme is a 5-year one-time deposit scheme for the Indian citizens who have attained the age 60 years. An individual who has attained 55 years but not crossed 60 years of age and got the superannuation benefit is also allowed to invest in the scheme. The account should be opened within one month after getting the retirement benefit and the invested amount should not cross that benefit amount. An individual can operate more than one account. The account can be in single mode or joint mode. There is no restrictions on the number of accounts, one can open in this case. The account can be opened with cash of value up to Rs 1 lakh and for above Rs 1 lakh, you have to pay through cheque. The investment amount should be in multiple of Rs 1000 and the maximum value of the investment is Rs 15 lakhs. The nomination facility is available for this account and the account can be transferred from one post office to another post office. The maturity period is 5 years and you can extend the tenure for another 3 years subsequently. Investment under this scheme is tax-free under section 80C of income tax. Interest can be withdrawn through auto credit into savings account standing at the same post office, through PDCs or Money Order. Quarterly interest is payable on the first day of April, July, October, and January into your savings account held with the CBS post office. Premature withdrawal is allowed after one year with a penalty of 1.5% and after two years with a penalty of 1%. How to open SCSS Account in Post Office? Fill up the form with some details such as the name of applicants, address, Date of birth, nomination details etc. Submit the filled up form along with the address proof and proof of identity as KYC documents and passport size photographs. You must carry original documents to post office for KYC verification. PPF account is the well-known savings scheme for the common investors. The disciplined investing in a PPF account can give you a huge return due to compounding. Moreover, the PPF is in EEE category in income tax which means in any of the phases, PPF is not taxable. It is a huge advantage of PPF over the other savings scheme. Though most of you know about PPF, I will discuss some key features over here. An individual can open a PPF account with Rs 100. The maximum limit of investment in a year is Rs 1,50,000. And you have to deposit at least Rs 500 once in a year to keep it active. The maturity period is 15 years and you can extend the limit for further 5 years and so on within one year of maturity. The investment cannot be premature before 15 years. But you can withdraw partially from 7th year after opening the account. You can also take a loan from PPF account after attaining 3 years of account opening. If you want to keep the savings remain invested after 15 years without any further contribution you can do that. The interest is accumulated into the account upon completion of a financial year and it is completely tax-free. A person can open an account in the name of his or her minor child but the total investment should not cross the specified limit. In this case, a joint account cannot be opened and nomination facility is available for the account. How to open PPF Account in Post Office? First, download the form A to open a PPF account. Fill up the form with the name of the applicant, address etc. Paste the passport size photograph on the form. National Savings Certificate is a very popular scheme for the tax savings. It provides you the guaranteed return and it is backed by the government of India. Due to its guaranteed return and tax benefit, it is the most popular amongst the salaried class in India. The following features which you should know before investing in NSC. NSC can be held single or jointly. Only individuals can invest. HUF and trust cannot invest in NSC. In the case of minor, there should be a guardian. There is no maximum limit for investment and it is available for tenure for 5 years and 10 years. You can invest in NSC a minimum of Rs 100 and available denominations are of Rs 100, Rs 500, Rs 1000, Rs 5000 and Rs 10,000. The interest is compounded yearly. But the interest will be accrued in your NSC account yearly. You can claim the tax benefit for the invested amount under the section 80C of income tax act. But in the subsequent years accrued interest will be added to other income and again that can be claimed as a tax benefit. If the interest is not taxed every year, the accrued interest during maturity will be taxable. The NSC attracts 4% interest rate if you have not withdrawn the money after maturity. The NSC can be transferred from one post office to another post office. Deposit certificates can be used as collateral for a loan from a financial institution. How to open NSC in Post office? First, download the form to open an NSC. Fill up the form with the name of applicant, address etc. and take the signature of an authorized agent. Kisan Vikas Patra is another small savings scheme which attracts a very good interest rate with security. It is also available in the denomination of Rs 1000, Rs 5000, Rs 10000 and RS 50,000. An individual can invest in KVP in single or jointly with other. It can be purchased in the name of minor also. In that case, one guardian should be present. Nomination facility is available and the deposit can be transferred from one post office to another post office. Presently, the invested amount is doubled in 113 months and there is no maximum limit for the investment. The deposit can be withdrawn after 2 and ½ years after the date of investment. Trusts and HUFs are not eligible for investing in KVP. You cannot claim the tax benefit on the invested amount under section 80C and also on the interest earned. This is the biggest disadvantage of this product. How to open KVP in Post Office? First, download the form if you are planning to invest directly without the help of an agent. If you want an agent to help you, this form is applicable. This is newly launched scheme for the girl children. If your girl child is below 10 years, you can open the account in her name in any of the post offices. The following features are applicable for the Sukanya Samriddhi accounts. The minimum investment in this account is Rs 1000 and maximum investment is Rs 1,50,000 in a financial year. If you are not able to pay Rs 1000 in a year, you have to pay a penalty of Rs 50 to activate the account. The account can be closed after the child attains 21 years of age. Partial withdrawal of 50% of the balance accrued till last financial year is allowed when the child attains 18 years of age. I have written a detailed post about Sukanya Samriddhi accounts which can help you out about your queries. The above list of Post office savings scheme is actually good for those persons who want a risk-free return. The investment amount is started from a very small amount. The post offices are located everywhere including rural areas in India which benefit the rural customers to a large extent. In the rural area where there are no banking facilities available and other modes of investments are difficult can think of those schemes. For the urban area, the tax benefit of PPF, NSC and Sukanya Samriddhi Accounts is beneficial for the investors.